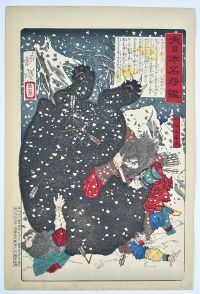 Abe no Hirafu fighting a giant bear in the snow from a set of 51 prints Dai Nippon meisho kagami, “A Mirror of Famous Commanders of Great Japan.” The set was published by Ebisuya Shoshichi (the first 11 prints) and Funazu Chujiro between 1878-1882. Hirafu was a general for the Empress Saimei. On his return from a mission to the Emishi in northeastern Japan, where he signed a peace agreement , he presented the Empress with two live bears and seventy bear hides. Published by Funazu Chujiro in 1880. Fine, early impression with splashed gofun (only on the earliest states). Fine colour. Light album backing, otherwise fine condition. 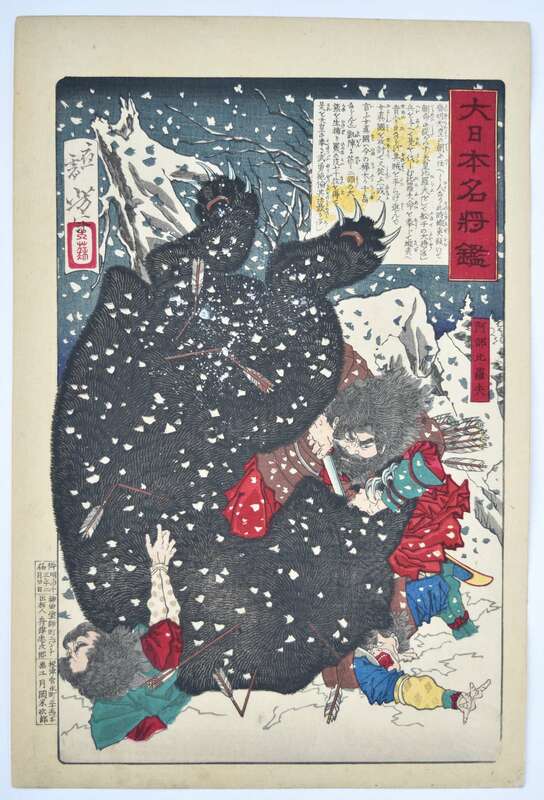 Signed Oju Yoshitoshi hitsu.